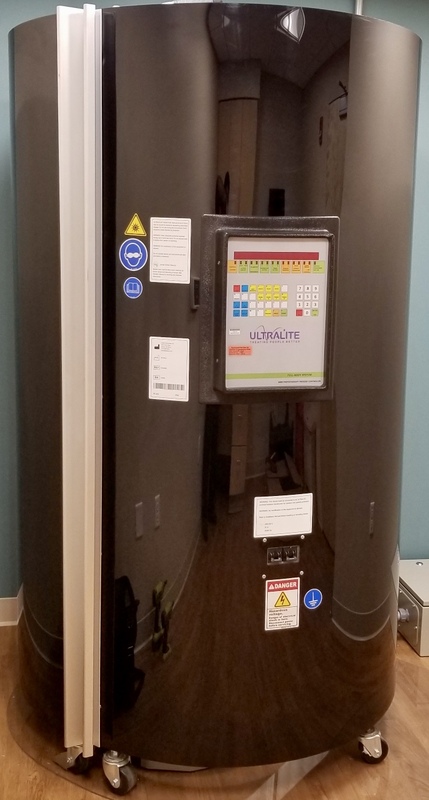 The Ultralite Full Body system allows dosimetry/timer control and requires no outside measuring devices, since an internal sensor measures light intensity. This system monitors for error constantly and can be programmed to lock out undesired operating modes. This allows the set up to be tailored so it can be easily changed at a later date. The control system can be updated with any future improvements so our equipment is never obsolete. State of the art electronics throughout the system. Solid state electronic ballasts for maximum intensity and lamp life. Computer control with integrating dosimetry for UVA and UVB (broadband and/or narrowband). Sensor checking and alarm circuit detects sensor malfunctions and stops system operation. Timer display mounted inside the chamber for patient convenience and safety. Programmable password system means maximum security with no keys to lose or break. A special interrupt button located inside so that the patient can stop treatment at any time. Selectable delayed start mode allows system to be set up by the technician and started by the patient. Programmable maximum time and dose entry limits for UVA, UVB, or UVB narrowband. Computer memory allows review of all entered and achieved treatment data. Unequaled safety features increase efficiency and patient confidence. An overhead mirror allows the operator clear view of the patient with minimal compromise of privacy. UV transparent lamp sleeves completely contain broken glass unlike wire grids, yet absorb less light. Two high-volume 10″ fans provide patient comfort and heat dissipation. Large non-tipping patient platform raises patient above bottom of lamps. A full-size polycarbonate floor plate confines the machine and protects the floor. Plug-in components can be easily installed by operator in minutes. 6’4.5″ High (7’10” with optional overhead mirror). 4′ X 5′ base requires minimum operating area. Approximate weight fully assembled, 300 lbs. Dedicated 208/230 volt single phase circuit. ULTRALITE provides a 5 Year Manufacturer’s Warranty against defects in materials and workmanship, excluding lamps. All of our Light Therapy products are Made in the USA in our Lawrenceville, Georgia factory. We offer full support and service for all of our PhotoTherapy systems, including the 6809 full body system. Also see our Service & Warranty pages for additional details.